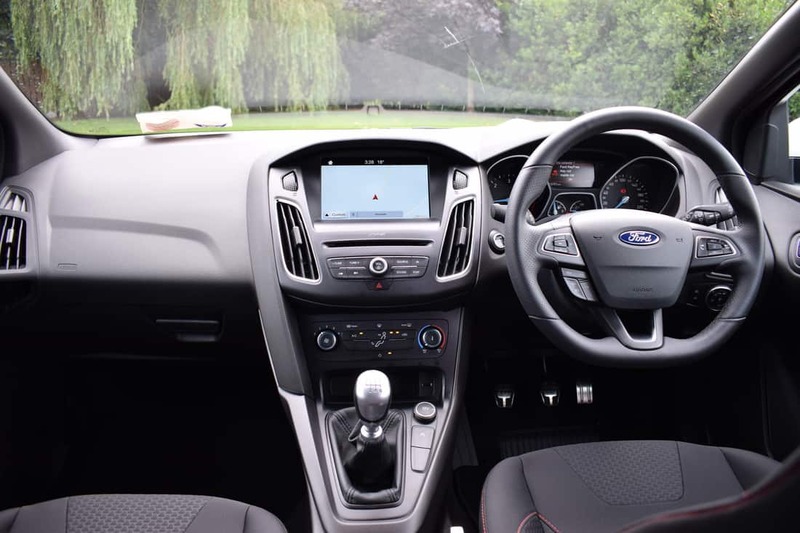 The Ford Focus passenger car range covers all bases with a specification to suit all tastes and an equally impressive engine choice. With an all-new Focus on the horizon, Ford is offering some fantastic deals on the current model. 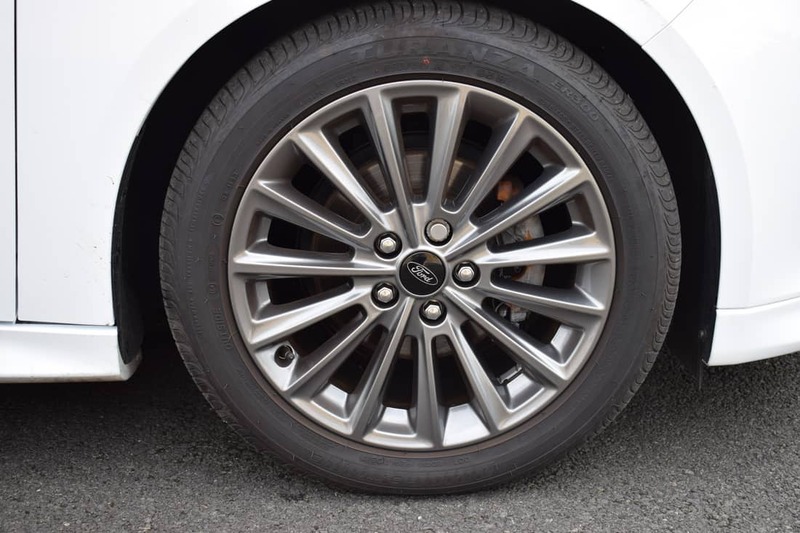 Whether you are after a Zetec, Titanium or ST-Line with a petrol or diesel engine, you are sure to be impressed by the incredible value on offer, and with the current Ford Focus hailed as being one of the best family cars on the market, driving thrills are guaranteed. The latest generation Focus was launched in 2012, and has remained the world’s best-selling hatchback car for the past two years. My test car was a Ford Focus 5-door in sporty ST-Line specification and was fitted with Ford’s terrific 1.5-litre TDCi (turbo-diesel) engine. Statistics for this smooth-revving engine are impressive, with 120bhp and 270Nm of torque on offer. The 0-100km/h sprint can be completed in just 10.5-seconds, on the way to a top speed of 192km/h (where permitted). Official fuel economy figures claim that this Euro 6 engine is capable of consuming as little as 3.4l/100km (83mpg) on an extra-urban driving cycle, with just 3.8l/100km (74.3mpg) being consumed on a combined cycle. 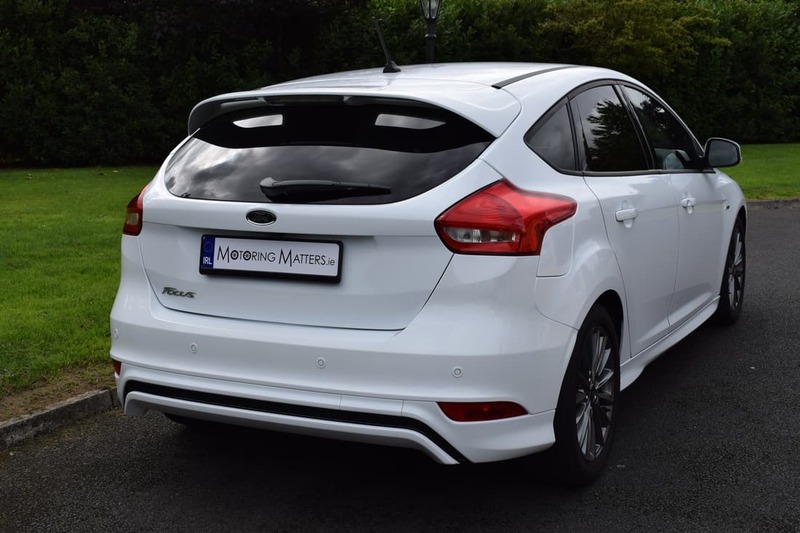 The Ford Focus in ST-Line specification looks fantastic from every angle – thanks to similar bodywork to the racy ST model. Compared to Zetec and Titanium models, the ST-Line model is largely de-chromed, as the grille, window surrounds and other details are in black. Inside the roof lining is also black and the seats have red stitching, thereby emphasizing the sporty nature of the model. Standard ST-Line equipment includes 17” ‘Rock’ metallic alloy wheels, full body styling kit, rear bumper with integral body-coloured diffuser, LED daytime running lights, front fog lights, sports suspension, exterior ST-Line badging, SYNC infotainment system, manual air-conditioning, Quickclear heated windscreen, sports pedals, keyless start, ST-Line flat-bottomed steering wheel in perforated leather, front scuff plates with ST-Line logo, centre console with sliding armrest, remote central locking , electric front & rear windows, along with many more comfort, convenience and safety features. Optional extras fitted to my test car included a Parking Pack (power-folding door mirrors and rear parking sensors), SYNC generation 2 with an 8” touchscreen, rear privacy glass, cruise control, rear view camera and a large rear spoiler. 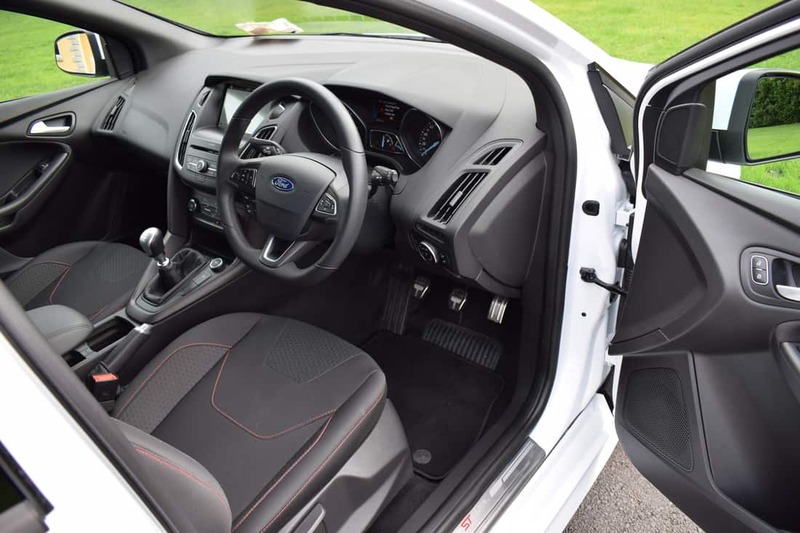 The cabin of the Focus ST-Line is ergonomically and logically laid out, with all of the cars major controls within easy reach of the driver. The dashboard is devoid of clutter and complication, and fans of the traditional handbrake will be delighted to hear that it is standard across the range. The soft-touch plastics on top of the dash feel particularly good, and the overall quality of the materials used in the cabin is excellent. 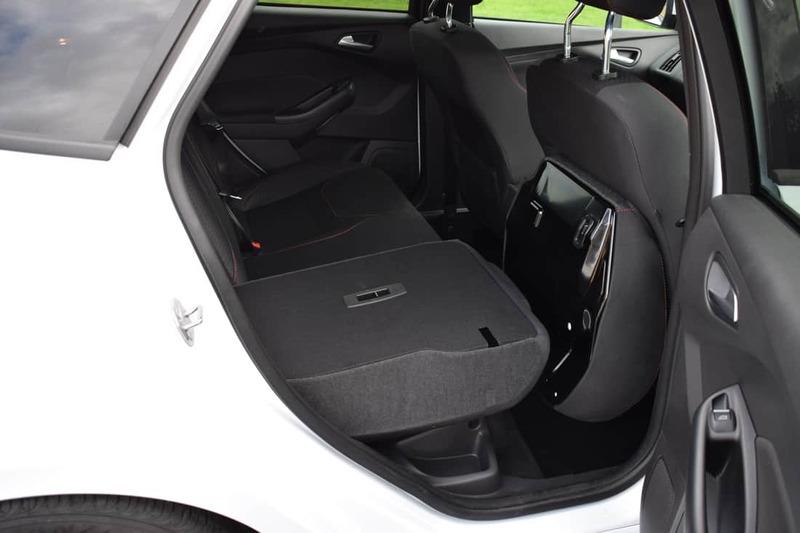 The front seats are both comfortable and supportive, while the rear seats have a split and fold feature. 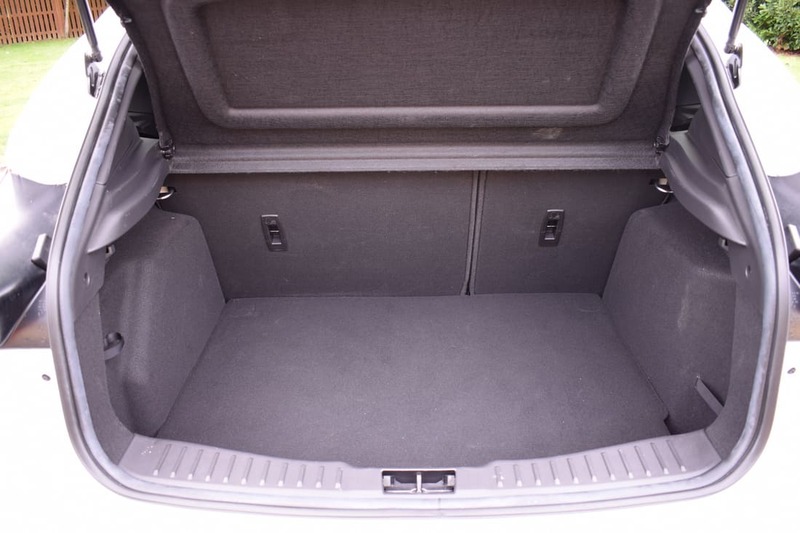 Boot space, with the rear seats in place is 316-litres, but this increases dramatically when the rear seats are folded flat. The Focus ST-Line’s ride is terrific on pretty much all road surfaces, and it’s composed in corners too. 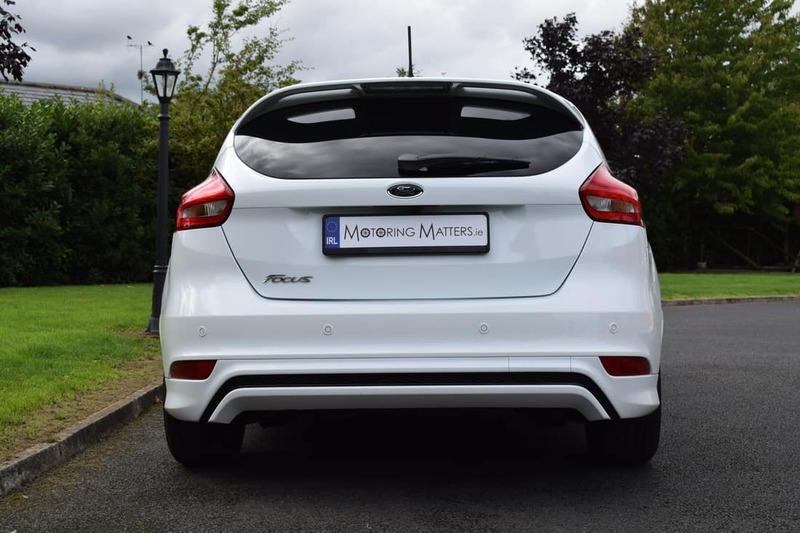 The Focus has a reputation for being one of the most engaging cars to drive in its class, and this is amplified even further in the ST-Line thanks to the lowered sports suspension. Feedback through my test car’s steering wheel was excellent and the car always felt well planted on the road. A 5-star EuroNCAP crash test rating is further testament to the outstanding build quality of Ford’s top-performing family car. Ex-works prices for the current generation Ford Focus ST-Line start at just €25,175 in 1.0-litre EcoBoost (petrol engine with 125bhp) guise, while the TDCi (turbo-diesel) model is priced from €26,220. 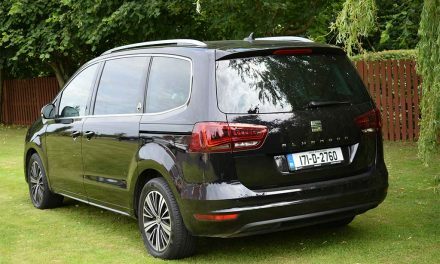 The addition of the optional extras on my test car brought the price to just over €28,000. 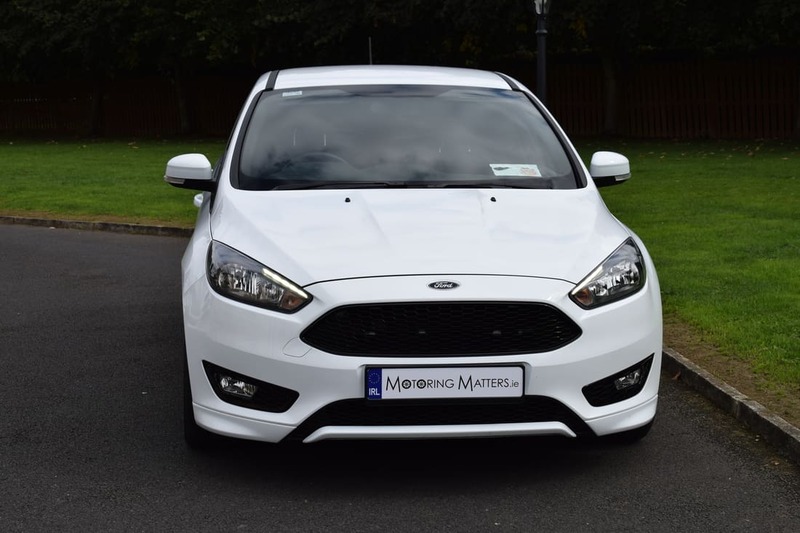 However, Ford’s nationwide ‘Clean Up For 182’ promotion offers buyers up to €4,400 off the price of the ST-Line specification and up to €4,950 off the price of a Titanium model – making the current generation Focus a genuinely tempting buy indeed. A 7-year/100,000km warranty comes as standard, while a special finance rate of 4.9% is available for registration by September 30th 2018. 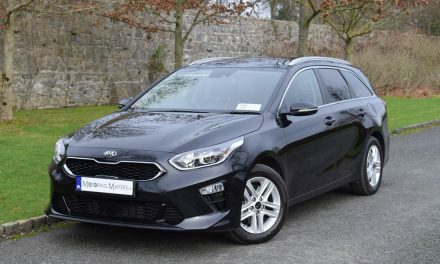 Overall, the Ford Focus is a stylish, well built, comfortable, refined, dynamic and sensible car, while Ford’s current, money-off, promotion adds exceptional value to the mix. 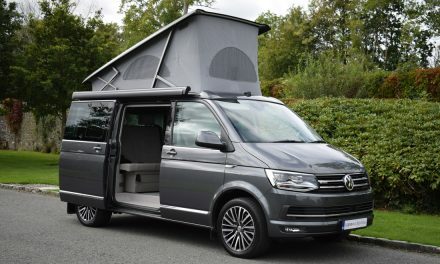 NextVolkswagen California – Luxurious Camping.